Threatened by a hungry polar bear! And look at those teeth! This entry was written by whyevolutionistrue and posted on December 27, 2018 at 2:30 pm and filed under animal behavior, mammals. Bookmark the permalink. Follow any comments here with the RSS feed for this post. Both comments and trackbacks are currently closed. That made me think of this poor woman and her baby that were killed in the Yukon recently by a grizzly bear. She and her partner were competent, experienced outdoors people and she most likely just made a bad decision that ended her life and the life of her baby. It was really devastating in the north. I can’t imagine the horror of her partner returning to be charged by the bear then find that horrible scene just outside the cabin of his dead family. It’s so remote, he had to use an emergency beacon to get help. Ya, that story is truly horrifying. The women who was killed was in my sister’s choir in Whitehorse. They are all pretty shaken by it. Awful. My friend, who lives in the Yukon, said people were really shaken by it. So many people knew her! Yes, love that cartoon. That photographer did not seem to be taking many pictures. Hoping he brought a second pair of underwear. It was the part of a prey/predator relationship few will know. But that man sure had his odd polar-iced experience! He was not shown using his big rig resting nearby inside the box. I think there were cameras mounted on the sides of the device since he was shown doing a commentary as the “attack” took place. Could have been some selfies since there was a lot of camera shake. He had multiple video cameras filming across the interior of the “bear box” and out of the opposite side. Gordon Buchanan (for it is he) is one of the rising stars of wildlife photography. One of the bits of technology that he has made major use of (though hardly a pioneer) is combining motion-capture “trail cams” with more traditional “hide” work, and this is an extension of that work. I don’t remember the details of that expedition, but I’d expect them to have hours of footage from motion-capture cameras inside the box looking out, and a plate of fresh seal in the “hot seat”. This is from the reasonably good BBC 3-part series The Polar Bear Family and Me, 2013. The humans are on screen too much for my taste! One can watch it on Amazon Prime Video & Netflix [not on my UK Netflix though]. Also available for free in the UK HERE on BBC iPlayer. Gordon Buchanan and his crew followed mother Lyra & her cubs Miki & Luca for a year in Svalbard. The producer was admonished by the Norwegian authorities for this stunt, putting Lyra at risk of being shot had she managed to open the sweeties box on Crunchie Buchanan. 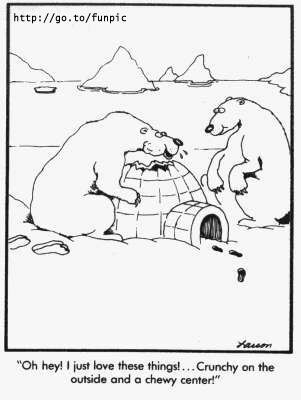 I can’t imagine a producer allowing the “bear box” to be used with a human inside it without having first been proved several times with a plate of warm seal bits and a load of cameras. To not have validated the design by some such exercise would have been (I choose my words carefully) criminally negligent. Having had more than a few dealings with Norwegians about less dangerous plans, I’m pretty sure they would also have treated it as seriously, had anything gone wrong. Viz : criminal prosecution, trial, and jail time. Regardless of what they say on the film. The Svalbard Deputy governor Lars Erik Alfheim wrote to a producer of the show – a Jason Roberts to give him “advanced warning of a fine for disturbing the polar bears,” saying he could face a fine of 50,000 Norwegian krona – “When you make a cage with a man inside and a polar bear attacks it, that is a disturbance,” Mr Alfheim said. If the animal had got into the box and attacked the presenter the production team would have had to kill it. Well, I assume the fine has been levied, and on re-entry to Norwegian jurisdiction those involved are going to be detained until the fine is paid. As an American lawyer once said, “It depends on what the meaning of the word “is” is.” And in this case they’ve been spelled out, in no uncertain terms, what the meaning is. I haven’t been keeping a track, but the clear inference is that the BBC Natural History Films Unit won’t be doing any more filming in Norwegian territory for the foreseeable future. Given that, if the bear had breached the cage, it would have been shot and generally, in polar bear / human encounters, the bear has to die, any expedition to the Arctic must be a threat to polar bears. So do people making – what are essentially entertainment – programmes think about the ethics of what they are doing? I’m sure the answer is yes, but I’d be interested if anybody has got any insights into the process. Just read Michael Fisher’s comment, so I’m not so sure the answer is yes anymore. I found the segment interesting, but not interesting enough to justify the risk to all involved. Give me a good research project documentary shot from a respectful distance. The distance doesn’t need to be great – the camera (a lump of machinery) only needs to be able to survive being “bear blown” aside from the bait. In appropriate environments, as the “spy in the rock/ penguin rookery etc” programmes of a couple of years ago showed, you don’t necessarily need a plate of bait. BBC or not, is this science? Sorry to say that I find this footage not only far from interesting, but even boring. Moreover, no fascination justifies the risks taken. Today’s cameras can deliver beautiful images from a safe distance. As Michael Fisher’s comment makes clear the ‘bear box’ was not something they had just cobbled together and thrown out onto the ice in a completely gung-ho manner. It was a tried and tested design that they were confident would protect Buchanan and I am sure a sane man would not have got into it if he had not had a high level of confidence that he would be adequately protected. It is also clear from the footage that the intention was to film the bear hunting at a seal hole from close quarters and I believe the bear-box was intended as a protection to allow this rather than specifically to make Buchanan into bear bait for some exciting shots of him being attacked. Did they need to get Buchanan as close as that in order to get interesting shots of the action? As has been pointed out in this thread there are various remote filming techniques available – many of which Buchanan has considerable experience of using in his own career – in addition to long focal length lenses that allow filming from a safe distance. Much can be achieved with these techniques but they do not necessarily enable the film-maker to get the same shots as a human camera operator right in close to the action. These were judgements the film crew had to make and of course it is open to debate as to whether they made the right call. The Norwegian authorities apparently thought not (though I am surprised that before granting filming permits they did not have fairly detailed advanced information about the planned filming methods). However, the BBC is a somewhat risk-averse organisation so I don’t doubt that the decision to go ahead was taken only after robust risk-assessments were made. Both the bear and Buchanan were unscathed by the experience so in that sense at least the film crew ‘got it right’ but was the risk worth taking for the footage it produced? You pronounce it ‘boring’ which I find an odd reaction – it may or may not be ethically justifiable but the clip is surely rather dramatic! You are perfectly entitled to your view but in answer to your question ‘is this science?’ I would suggest that generally wildlife documentary makers are not carrying out science as such but story telling (though they do sometimes make new discoveries about behaviour and ecology). To judge whether Buchanan and the BBC succeeded in telling us about the lives of polar bears it might be fairer to see the whole programme rather than base your judgement on a very short clip from it. You seem to suggest the scene was accidental. Really an out-take. Perhaps so. I never get the same sense of annoyance watching Attenborough’s films. I always feel he’s being very respectful of the critters he’s documenting. Buchanan seemed to milk the gruesome potential of the bear as if to frighten children. It’s like dangling meat over alligators for the tourists. No I am not suggesting it was an out-take – it was included in the full documentary. I don’t think it was necessarily what they set out to get though. I readily accept that it is legitimate to question whether the film crew made the right judgement here and perhaps they did fall the wrong side of the line, but having seen a variety of Buchanan’s work I really don’t believe that he disrespects the critters – rather the contrary. Attenborough is not a camera-man so he would not have put himself in this situation in any case. I am not sure however, that his films have not included sequences where the camera operator undertook similar risks to get the required shot. I question whether this is a required shot. I’m guessing Attenborough would not have used this footage. ‘Required’ in the sense of what the producer wanted. I am not making any judgement on whether they could have told their story without it. We’ve been binging Gordon’s latest slew of shows – we find him quite delightful. This one was kind of terrifying. It is just so clearly a strong predator. He reminds of the old Farside with the crocs looking at the humans and declaring them perfect -soft on the outside, crunchy on the inside. D’oh – just ignore the second half. I scrolling too fast, eating lunch and am otherwise distracted. If I remember correctly the Larson croc line was something like “that was great, soft and pink and no antlers”. Reminds me of me, rummaging thru the cheese and sliced meat drawer in the fridge as I am ‘hunting’ for a sandwich. Excellent video. What a beautiful animal, though. Have you seen the video where polar bears and tied-up dogs play together and show affection for each other? Yes! I imagine the bears and dogs must have frequent contact with each other to get to that understanding. Both bear and dogs must have well fed for that behaviour to be to the fore. Both you and rickflick, thanks for the arguments, leading to this short but instructive debate! Be well, and have a healthy 2019. Happy New Year to you too! May 2019 be rich in discovery and good experiences.